In Georgia, some employers will tell workers to do jobs that they do not typically do. For example, a roofer may be told by their employer to clean a gutter or perform pressure washing. These jobs require eye and face safety equipment, but because the work is not typical for the employee, safety precautions may not have been taken and a workplace injury happens. This sort of situation is common and is why eye and face protection violations were on OSHA’s Top 10 List of Most Frequently Cited Violations for 2018. Some of the other top cited violations by OSHA are listed below. If you were hurt on the job, whether or not you think your company violated the law, you should always contact a Georgia workers’ comp attorney to review your legal rights. Fall protection was the most cited violation for 2018, according to OSHA’s new report. There were 7,216 total violations of this OSHA standard. This standard details where there is fall protection required on the job. It also covers which safety systems are appropriate for specific situations and how employees should be supervised to prevent falls. It is intended to protect workers who are working or walking on surfaces that are above six feet. Standard 1926.501 states that every employee that works in residential construction more than six feet above the ground must have the protection of guardrail systems, a system of safety nets, and/or a personal fall arrest system. This standard relates to chemical hazards – those that are made at the work site and those that are brought into the work site. There were 4,537 total violations in 2018, making it the second-most cited violation. 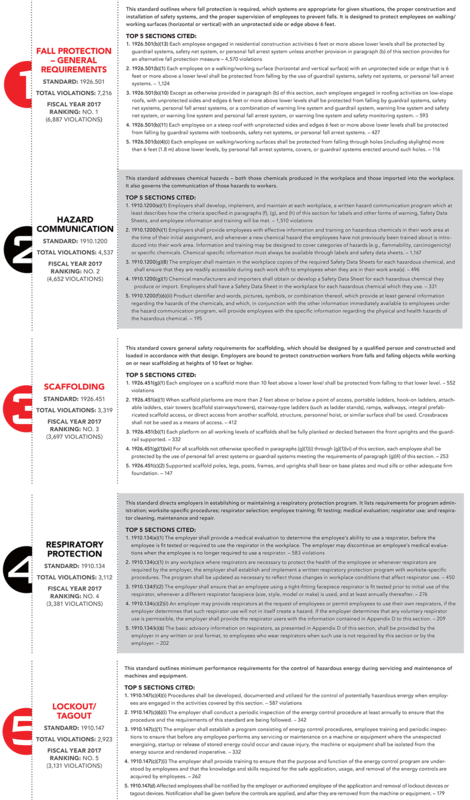 The standard stipulates that employers must have a written hazard communication system. There were 1,510 violations of this section. Also, employers are required to protect workers with good information and proper training on how to handle hazardous chemicals on the job. The information and training must include categories of major hazards, such as carcinogenicity and flammability. This was the No. 3 most cited violation on the OSHA list, with 3,319 violations. Standard 1926.451 covers the requirements for work-site scaffolding. It should be designed by qualified parties and built and loaded per that design. Employers must protect workers from falling objects and falls when they are working on/near scaffolding that is 10 or more feet high. The standard notes that every employee on a scaffold that is more than 10 feet high must be protected from falling to a lower level. Also, every platform on the scaffold must be decked or planked and the guardrail must be supported. Check the complete list here: OSHA’s Top 10 List of Most Frequently Cited Violations for 2018. If you were hurt on the job in Georgia, you could be entitled to compensation under the state’s worker’s compensation law. You should contact The Mann Law Firm. Our skilled attorneys can help you to obtain compensation for your injuries on the job. The consultation is free, so you have nothing to lose. Please contact us today.